HAVANA -— Brushing off decades of distrust, President Barack Obama and Cuban President Raul Castro shook hands Monday in Havana's Palace of the Revolution, a remarkable moment for two countries working to put the bitterness of their Cold War-era enmity behind them. Obama and Castro stood together as a Cuban military band played the national anthems of Cuba and the United States — stunning sounds in a country where resistance to the U.S. has been part of the national mission for decades. Greeting each other warmly, the two leaders inspected an honor guard before sitting down in front of American and Cuban flags. Outside the palace in Havana's sprawling Revolution Square, Obama posed for a photo in front of a giant sculpture of Ernesto "Che" Guevara, creating an indelible image sure to reverberate in Cuba and beyond. The revolutionary leader was once one of Fidel Castro's top lieutenants, his face an iconic symbol of Cuba's revolution that is revered by some but reviled by others. Paying tribute to another Cuban independence hero, Obama adjusted a wreath at the foot of a 59-foot statue of Jose Marti, calling his trip "a historic moment." The long-awaited meeting between Obama and Castro was one of the most scrutinized moments of Obama's 2½-day trip to Cuba, the first presidential visit in nearly 90 years. The White House's attempts to get Castro to agree to a joint news conference appeared unsuccessful, and it was unclear whether they'd answer any questions. 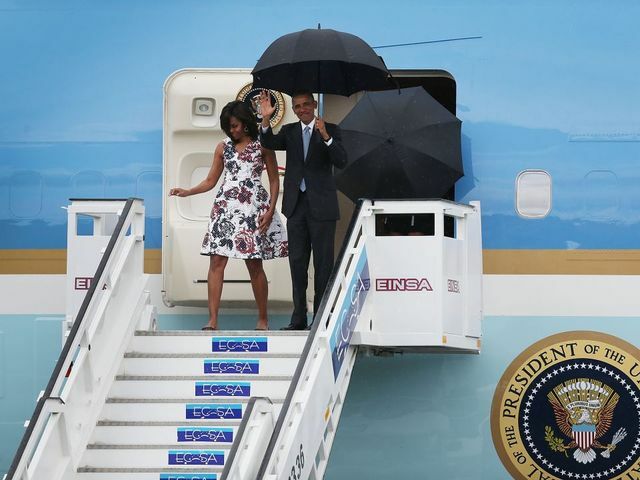 Obama came to Havana hoping his visit would spur Castro to offer gestures of good faith and meaningful change, undermining critics who accuse Obama of kowtowing to an authoritarian government. In the last year-plus, Obama has taken sweeping steps to lift decades-old U.S. restrictions, and American businesses have eagerly followed suit. Western Union became the latest company to take advantage of Obama's move last week to relax financial controls, announcing Monday that it will start processing remittances from non-U.S. countries into Cuba. In the last few days, hotel chains Starwood and Marriott have announced plans to operate on the island, and U.S. airlines and cruise lines are poised to begin service soon. To the dismay of Obama and his critics, reciprocal steps by Cuba have been in short supply. Since succeeding his brother Fidel in 2008, Castro has orchestrated economic and social reforms with broad-based impact, though they appear slow to materialize. Not only are hundreds of thousands of Cubans now able to pursue free enterprise, but restrictions on cellphones and Internet have been eased and citizens feel more comfortable discussing Cuba's problems. Yet Castro hasn't budged on changing Cuba's single-party system or easing strict limits on media, assembly and political dissent. Repeatedly, his government has chided Obama for saying he wanted to empower Cubans. On his first full day in Cuba, Obama also planned an event with U.S. and Cuban entrepreneurs aimed at championing Cuba's fledgling private sector. He was to be feted in the evening at a state dinner, an honor illustrating just how far the U.S. and Cuba have come despite their deep ideological differences. "We felt that coming now would maximize our ability to prompt more change," Obama told ABC News as he started his trip. "Particularly because this has been welcomed by the Cuban people with enormous popularity." Associated Press writers Julie Pace, Michael Weissenstein and Peter Orsi contributed to this report.